OK, everyone. 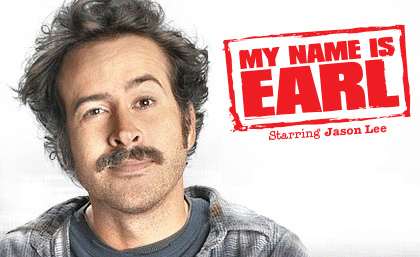 If you didn’t see My Name Is Earl last night, you missed one of the funniest and gay-friendliest episodes of a TV show I’ve seen in a long time…possibly ever. If you follow the show you know Earl is currently in prison, having taken the fall for his ex-wife, Joy. The warden sees that Earl is really good at fixing problems and getting people to get along so he asks Earl to stop the black gang and the Spanish gang from constantly fighting, and in return he would shorten Earl’s sentence by a month (I get a feeling Earl will be in prison for a good part of this season). Earl tries his best but no go. He finally decides to talk to the leaders of both gangs. And as he tells them to say one nice thing about each other, he goes to block the security camera, thinking they don’t want to be recorded, they both start making out! It was an incredibly funny episode, but also portraying gays in a positive light.